In 1999, Molly McConnell walked into the Grand Avenue Boxing Gym in Portland, Oregon for the first time, and her love affair with the sport of boxing began. After a few weeks of participation in a women’s boxing fitness program, Molly was approached by coach Ron Woodward and invited to train with him to compete as an amateur boxer. Molly was an eager student and a quick study, and within a couple of months she competed in her first amateur bout. Within a year, Woodward had led Molly to several state championship titles, including both the Oregon and Washington State Golden Gloves. Molly’s great potential and hard punching style led Woodward to urge her to begin training with Bill Meartz at the West Portland Boxing Gym. Meartz has worked with countless national champions and US Olympians and is regarded as one of the best amateur boxing coaches in the country. In 2001, Molly began her studies with Meartz and world renowned boxing coach, Leonard Trigg and her amateur career took off. She quickly earned a reputation for her piston like jab and her impressive power in both hands. Under Meartz’s expert guidance, Molly went on to win four amateur national championship titles. She took a bronze medal at the 2002 National PAL Championships and won the Women’s National Golden Gloves, becoming the first person from Oregon (male or female) to take home a National Golden Gloves championship in 18 years. She also won the Ringside World Championship Tournament , scoring three stoppages in her four fights. In 2003, Molly took a silver medal at the US Women’s Championships in a fight that was decided by one point. She also took a silver medal at the National Golden Gloves in a highly controversial decision. She went on to win the National PAL Championship and repeated as the champ at the Ringside World Tournament. She ended 2003 as the number one ranked amateur welterweight in the country for two years in a row. With these successes under her belt, Molly turned pro in 2004. She experienced the same type of success as a pro as she did in the amateur ranks. Woodward rejoined the team and with Ron and Coach Trigg at the helm, Molly maintained a 60% knockout ratio and was widely considered one of the premier female fighters in the world. Working her way up the ranks, in 2011 Molly finally achieved her goal of becoming a professional World Champion, winning both the WIBF and GBU jr. welterweight titles. Molly has twice been named WBAN fighter of the month and as a pro, was selected as the WBAN rookie of the year. She was also nominated for the prestigious Oregon Sports Awards Harry S. Glickman Professional Female Athlete of the Year, presented by NIKE. She also held the WSBC Jr. Welterweight and Welterweight titles and both the WIBF and GBU Jr. Welterweight World Championship titles. In 2012, Molly decided to open her own boxing academy after being involved with coaching both amateur boxers and professional boxers and MMA fighters for over 15 years. The gym has a variety of non-contact boxing fitness classes geared toward fitness enthusiasts and busy professionals alike. McConnell's Boxing Academy also has an amateur boxing team as well as training for professional fighters. This is not your average boxing gym! At McConnell's, the focus is on teaching proper technique, conditioning, and the science of boxing. The programs stress a strong foundation of the basics and building your skill set one piece at a time. The classes are fun and encouraging and the instruction is world class. Whether your goal is weight loss, better overall conditioning, endurance, confidence, competition, or just getting a great workout in a clean, professional environment, this is your spot! All fitness levels are welcome and NO experience is necessary. All coaches are USA Boxing certified and McConnell's Boxing Academy is a proud member of the Lloyd District small business association. Denise McConnell is an assistant coach (USA Boxing Certified) and co-owner at McConnell's Boxing Academy and has been involved in the sports of boxing and kick boxing for over 10 years. Denise played collegiate level volleyball and studied kick boxing under acclaimed instructor and former European champion Jean Carillo. Denise provides clients with excellent instruction and works with a lot of our beginning clients to get them familiar with the basics of boxing. She also works extensively with our competition team as an assistant coach, nutritional specialist and mitt holder extraordinaire and is always eager to answer questions and help our clients grow in any way she can. Jordan is the assistant head coach of the McConnell's Boxing Academy competition team and has spent over ten years training in a variety of martial arts including Boxing, Freestyle Wrestling, Brazilian Jiu Jitsu and Dutch Kickboxing. He spent the bulk of his kickboxing career training under Ira Evanson of Valhalla MMA and has been coaching since 2012. Jordan has trained MMA fighters, boxers (USA Boxing certified), law enforcement officers, professional NFL players as well as every day people who just want to lose weight, learn self-defense and have fun. His style relies heavily on boxing fundamentals and taking what each individual brings to the table and molding it into a flexible and efficient skill set. Jordan's greatest strengths as a teacher are his outstanding communication skills, his approachable personality and his desire to help everyone reach their potential. Jordan openly loves dogs and secretly loves cats, and is a proud dad to his adorable daughter, Peregrin (like the falcon..). He is one of our resident southpaws but we love him anyway...Jordan teaches Cardio Boxing and Mitt Madness on Monday evenings, as well as being on our Mobile McConnell's coaching staff. He also offers private one on one lessons and small group training in boxing, kickboxing, self-defense and weight loss. Please contact the gym for Jordan's rates and scheduling. Josh Herman comes to Portland via Ventura County, California (we forgive him) and has been a life long boxing enthusiast and a student of boxing history. Josh grew up watching boxing and started training in his mid-teens. He has been actively training in the sweet science for over ten years and has been focused on coaching for the last 4 years. Josh has honed his craft at several high- profile gyms and fought under Head Coach Molly McConnell. He is an assistant coach for our competition team as well as being available for private lessons and small group training. Josh is patient and articulate and works with people of all skill and fitness levels. He strives to bring out the best in every athlete he works with. He centers his teaching philosophy on proper footwork, technique and focused mitt work and is USA Boxing certified. Josh has a six year old son named Henry who is the center of his world, and he is a master electronic repair technician who specializes in all things audio. In his spare time, Josh also loves to build and ride custom motorcycles! Coach Trigg is a quiet, humble repository of skill, knowledge, philosophy, experience and insight that the world does not come across often. His system of boxing has become its own martial art. Coach Trigg’s boxing system will help any combat athlete improve their hands, from traditional western style boxing, to Thai boxing and MMA. Coach Trigg has been involved in boxing and martial arts from childhood and he has trained many successful champions in Boxing, MMA, Thai Boxing, Kali and JKD. He is the president of the Lamenco Escrima International Association and the President of the Oregon Thai Boxing Association as well as a USA Boxing Certified coach. Coach Trigg trained former two- time world champion Molly McConnell for 12 years and was instrumental in helping her achieve championships as both an amateur and a professional boxer. He has also trained past and current UFC fighters as well as training at the USA Boxing Olympic Training Center in Colorado Springs. Kate's fitness background is as varied as it is impressive. She began training in boxing and Muay Thai in 2009 and quickly fell in love with both martial arts. She joined McConnell's Boxing Academy in 2013 and has been a valuable asset ever since. Kate's competitive nature and ambition to push her own limits have led her to compete in the Portland Triathlon, and well as the Clackamas Cove Triathlon and the Hood to Coast. She is also an avid biker and has completed many 50+mile bike races. Kate's welcoming attitude and her desire to help others achieve their fitness goals and strive beyond their own personal best have made her the perfect instructor for our Morning Body Blast class. Her workouts are fun, challenging and adaptable for any fitness level. She also makes a mean homemade tortilla...ask her for her recipe! Laura is a veteran boxer and is also a member of the MBA competition team. She began her boxing training over 12 years ago and has trained in the US, Germany and Mexico under such highly regarded coaches as Bill Meartz, Leonard Trigg and now, Molly McConnell. Laura is a team leader and brings her positive, supportive attitude to every workout as well as her vast wealth of experience and technical precision. She is also an accomplished distance runner, placing first in several races in the Northwest. Laura is a school teacher by day, a practicing Buddhist and mom to the world's most amazing 5 year old (who also happens to be our official "Gym Baby"). Jesse Senzer is a Certified Personal Trainer through the National Academy of Sports Medicine (NASM) and a USA Boxing certified Coach. With nearly 20 years of boxing experience and 30 years of martial arts experience, she has been kicking and punching almost as long as she has been alive. Jesse started training in Tae Kwon Do at age 8 and moved on to Karate in middle school, earning her black belt at age 13. She wrestled in high school and trained Jiu- Jitsu and MMA on and off for years. She began her boxing training at age 18 under Coach Bill Meartz of West Portland Boxing, and has trained in Oregon, California and internationally at any boxing or MMA gym she could find. She is also and official for the Oregon State Athletic Commission and judges amateur and professional fights throughout the state. With an approachable style, she focuses her group classes and private lessons on boxing fitness and sound fundamentals. Success is measured by the puddles of sweat on the floor and your desire to keep coming back for more! Jesse currently teaches our Morning Boxing Class and is available for private sessions and small group training. If there was a prize for being excited about everything, Mel would be the World Champ! Mel is a member of our competition team and teaches the Combat Conditioning classes and also offers personal training for kids by appointment. If you want someone to challenge you while telling you, "You are a ROCKSTAR!! ", Mel is your person. She is encouraging and positive, with a large side of goofy. Mel also loves cats, peanut butter and has the best dance moves in the gym. Sara Pennington is a transplant from the Midwest and has been with MBA for a year. She shares the gym manager duties with Crystal and can be found most days hitting the bags, working mitts or talking technique with gym members. She is an incredibly talented artist who works mostly in the mediums of oil paint and graphite, and she also speaks both Spanish and Portuguese. She has a great dane named Cricket (yes, really) and enjoys camping and hiking during the Northwest summer. Sara fell in love with boxing because of the technical aspects of the sport and loves to challenge herself to perfect her punching, footwork and defense. She is always here to help new clients with questions and will gladly help you wrap your hands when you can’t remember how. She is also always available to discuss the finer cinematic plot points of any horror movie! Crystal Z. shares the gym manager duties with Sara and she has become a fixture here at MBA. She is often here for three hours of classes in a row and loves helping our new clients get comfortable with technique. She welcomes new members to our community with her infectious smile! 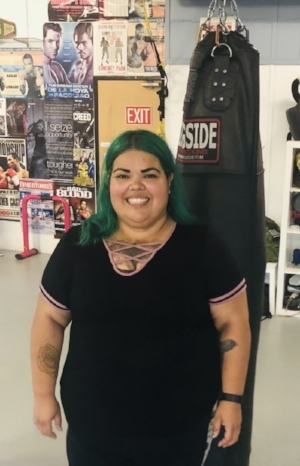 Crystal also helps teach and run our Fat Fists of Fury boxing class, centered on body positivity and creating an atmosphere of inclusion for everyone to learn boxing. She has volunteered over the years with various organizations in South America, Europe and Africa. She is a RABID Timbers fan (we forgive her, even though it’s soccer and not boxing) and she has only missed one Timbers game since 2013. She is currently working on starting a plus sized men’s clothing line and works hard toward elevating the visibility of different body types in the sports and fitness world. If you want to learn how to throw a mean right hand, ask Crystal for some technical pointers (just don’t stand right in front of her as she demonstrates…. You’ll be sorry..).